For the last night of Hanukah, we had family over, though it was a weeknight. I wanted to make borscht, a one pot meal. 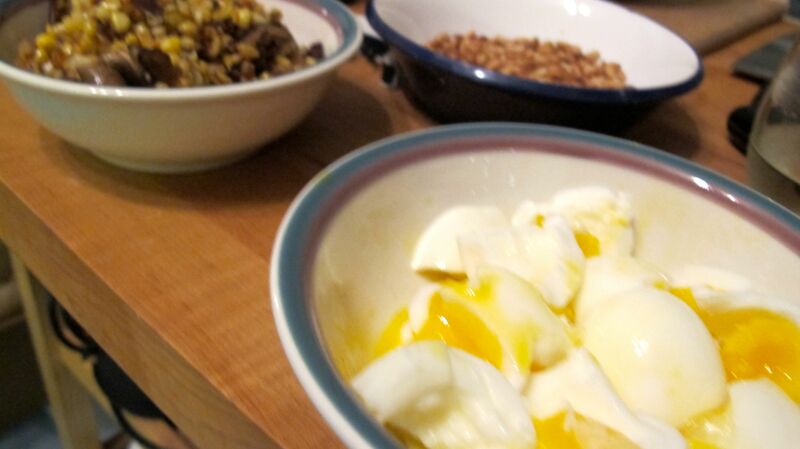 So I spruced up the salad and the dessert to diversify the otherwise one-pot-meal. Of course, I wanted dessert to be a regret-free decadence. The mousse has lots of egg, honey, and coconut-milk-whipped-cream. The shortbread has no grain, just hazelnuts, arrowroot, butter sugar and vanilla. First Course: Mushroom, Squash and Corn Salad with Mixed Lettuce. This salad has many components, because it was a first course to a light meal. Borscht was the main dish. So I wanted the salad to be flavorful, compelling, and a bit more filling than a simple green salad. I had autumn’s quash on hand, and summer’s corn in the freezer. I bought inexpensive dry mushrooms and rehydrated them, and they are a star in this dish. The other ingredients, I happened to have and they found a place here. My goal was for a filling, colorful salad, with lots of texture, both crunchy and creamy. The Lettuce Mixture. I used butterhead and radicchio, the latter for spice and color. I also added chopped chives and pomegranate seeds. My dressing was a simple balsamic vinaigrette. 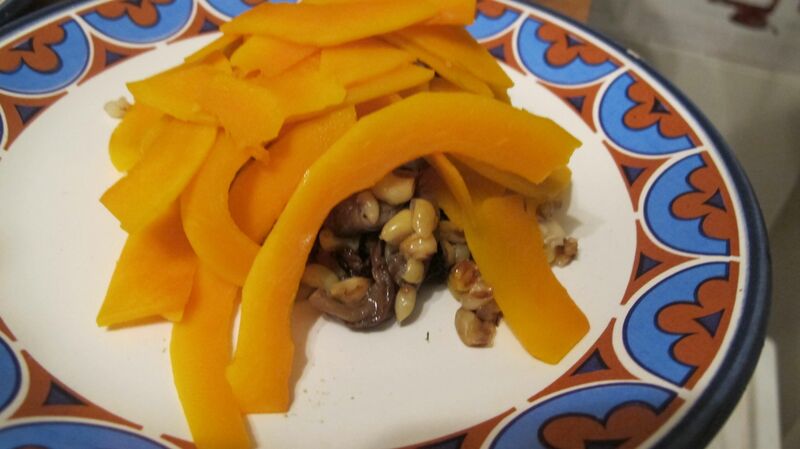 The Salad Base: Mushrooms, Corn, and Kabocha Squash. Halve and peel kabocha. Remove seeds. Slice the cut edge with a mandolin, or make thin slices with a knife. Blanche in salty, boiling water for about 45 seconds. Remove and and under cold water, then lay out to dry on paper towels. A friend of mine put crushed taro chips in her salad. It was a revelation. Of course they need to be added last minute so they don’t get soggy. 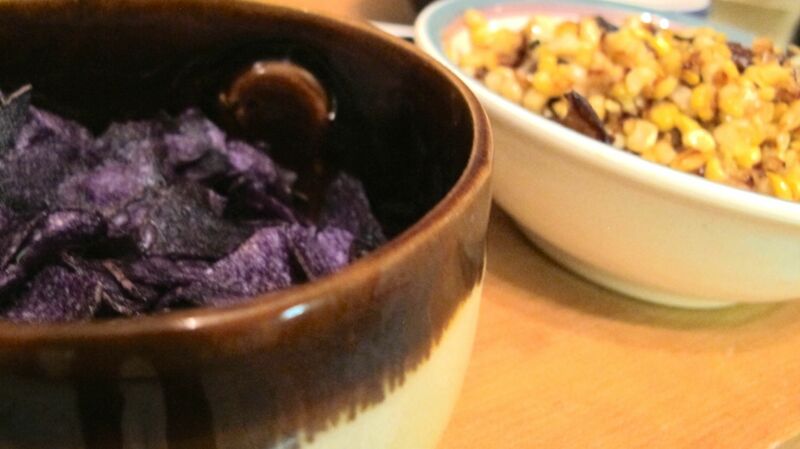 I used blue potato chips. 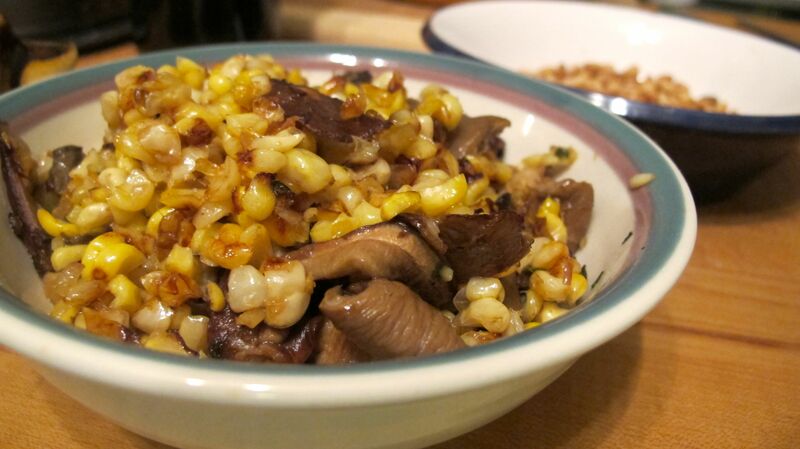 Sauteed Oyster and Porcini Mushrooms, and Corn: Dried mushrooms are less expensive than fresh. They come with directions on the bag. I thawed the corn several days in advance, and because it was just sitting in my fridge with nothing to do, it ended up in this salad. Put dry mushrooms in a bowl, and cover with simmer water. Soak for thirty minutes. Strain and rinse mushrooms, and squeeze in a towel to dry. Mix with minced shallot, chopped thyme, salt and olive oil and put aside to marinate. Heat oil over high heat. Once it is hot, add mushrooms, corn, a pinch of cayenne, salt and pepper. Cook for several minutes, then use a spatula to toss, and cook for another several minutes, until mushrooms and corn are lightly browned. Set aside. Soft Boiled Eggs. I followed Yotam Ottolenghi’s instructions for these, from his third cookbook, Plenty More. I highly recommend the book. I used one less egg than the number of people I was feeding. Place eggs in a pot of pooling water, and simmer for six minutes. Pour out the hot water and run the pot under cold water until you can remove the eggs from the pot with your hands. Continue to rinse under cool water until they are cool enough to peel. Peel and set aside. Composing the Salad: I put the mushroom corn mixture on the bottom with the squash on top of that. I would advise putting the squash on bottom and building from there. Combine lettuces, herbs, and pomegranate seeds vinaigrette and a pinch of salt in a bowl, and combine well. Gently mix in the chips and eggs. Cover the bottom of the plate with squash slices, spread out to your liking. Divide the mushroom corn mixture amongst the plates, making a mound in the center, on top of squash. Divide the lettuce mixture amongst the four plates, making a mound on top of the mushrooms and corn. Second Course: The Borscht. I served this with brown rice, which I soaked for almost 24 hours according to Nourishing Traditions rules. Soaking apparently makes grains (and beans and nuts) easier to digest, and enables more nutrient absorption by the body. But I seasoned the rice with shallots, turmeric, and raisins, so it was yellow, not brown by the time I served it. 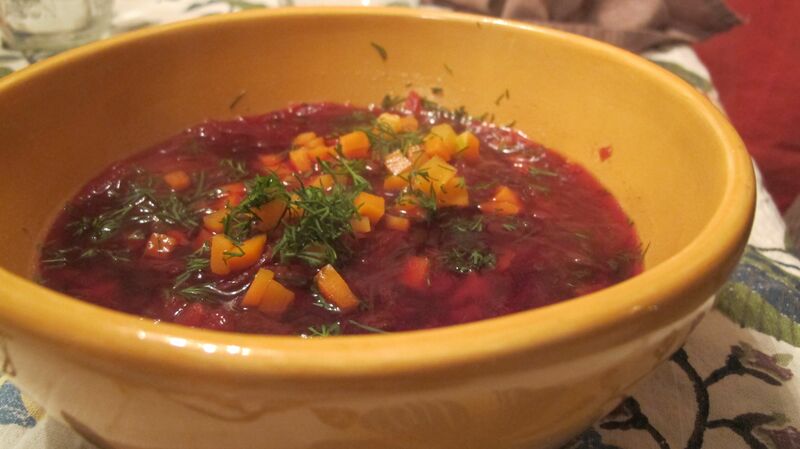 The borscht is made up of beets, cabbage, stew beef, onions, carrots and seasoned with dill. The work is in prepping the veggies. Roast beets, then peel and shred in food processor. Chop onion. Shred cabbage. Dice and blanche carrots. Pick, clean and chop dill. Season stew beef with salt and pepper. Brown Stew beef (in batches if necessary) in the pot where you will make the soup. Remove beef, and sautee chopped onion in same pot. Add beef to onion, and add enough water or stock to serve all your guests, plus an extra cup because it will reduce. Cook 1.5 hours. Add half the shredded beet and cook another half hour. Add the remaining beet, the cabbage and the dill and cook for thirty minutes. Serve, and garnish with carrots and additional chopped dill. 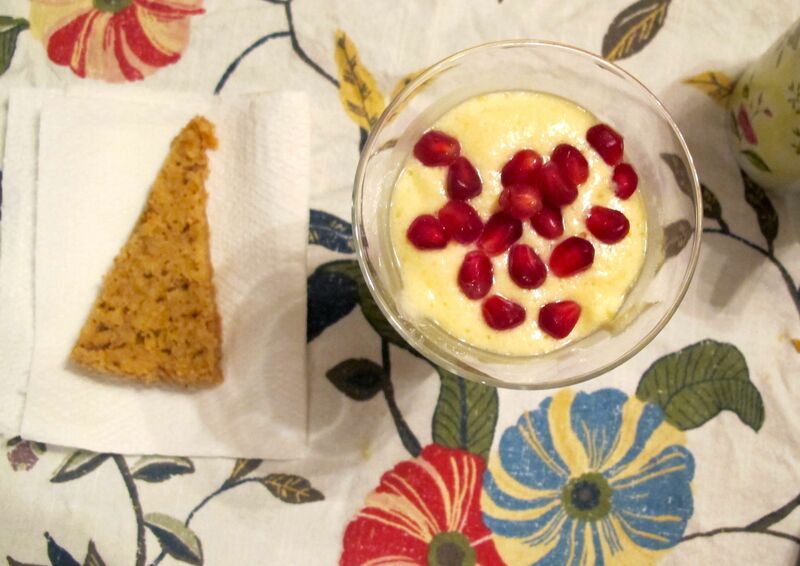 Lemon Mousse and Hazlenut Shortbread: These turned out delicious. The mousse tasted like the custard of a lemon bar, but lighter. The shortbread tasted like butter and hazelnuts, with the texture of candy. See Nourishing Traditions (the cookbook) for recipes. I followed them precisely, except instead of heavy cream in the mousse I used coconut milk cream*, and instead of rapadura in the shortbread, I used sugar. *To make whipped cream with coconut milk, place a can of it in the fridge the night before. When ready to use, open and spoon the cream off. It will have risen to the top. Whip like whipped cream.